Since the onset of the global financial crisis, or Great Recession, in 2007, the Eurozone has feared impending growing global debt levels, as well as sovereign debt within European countries themselves. In Europe, an ongoing fiscal crisis has created difficulties for countries including Greece, Ireland, and Portugal (now also Spain and Italy), to refinance their sovereign debs without aid. On May 9 2010, 27 European Union (EU) member states created the European Financial Stability Facility (EFSF) to secure financial stability by providing financial aid to the struggling economies (seeking approval of a rescue package worth €750 billion). Much discussion has focused on austerity – decreasing deficit spending, but also reducing benefits and public services. In the winter of 2011, German Chancellor Angela Merkel and former French President Nicholas Sarkozy aimed to form a “fiscal pact” to ensure balanced budgets to avoid another crisis. Last week, EU members gathered in Brussels to brainstorm job growth opportunities and prevent the crisis from deepening any further. In Ireland today, voting is taking place that will determine whether it ratifies the proposed fiscal pact, BBC News reports. “Across the board, Europeans expect the adverse effects of the euro crisis to continue for the immediate future. A median of 22% of those surveyed see the economy improving over the next year. 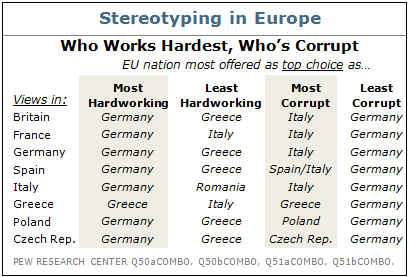 The least optimistic are the Greeks (9%). The most optimistic are the British, but still only a third (32%) have a positive outlook. By comparison, Americans (52%) are 30 points more upbeat about the trajectory of the economy than are Europeans.” — Pew Research Center. Are the stereotypes “fair”? Any readers in Europe growing increasingly frustrated? How have you been affected by the global financial crisis? What are some major concerns you have about the state of the world economy? My bank is Sovereign which was taken over by mega Spanish bank Santander when Sovereign nearly failed in 2008 – you can bet I’m keeping close tabs on news about that (and stock prices)! I don’t see how Europe will pull out of this without a lot of pain (and their pain will be ours, it’s a global economy). The people seem unwilling to do what is needed and you can’t blame them since they were promised these benefits all their lives and now the rug is being pulled out from under. It’s very difficult to face hard truths. I don’t think there’s a painless way out of this. Greece has such a glorious past – it’s very sad to see the state of that country now. Our country will be facing this soon and again, most in our government are not paying attention. And a LOT of people are dependent on the government for benefits, just like overseas. Being dependent on the government for your life is not a good thing! It seems to me that while a lot is being discussed in theory – job growth, austerity measures, and improving budget management – implementation of further solutions remains to be seen. I agree with you that there will not be a painless way out of this mess (especially in terms of benefits people are promised), and it likely will not occur quickly.